Can we get rid of 'community guns'? CINCINNATI — As families pick up lives broken in a rash of gun violence this year, two local men want the community to pick up — and trade in — unwanted firearms. Charles Tassell and Dale Mallory have a 12-month plan to get guns out of criminals' hands, and it starts this Friday at House of Hope Church on Elm Street in Cincinnati. 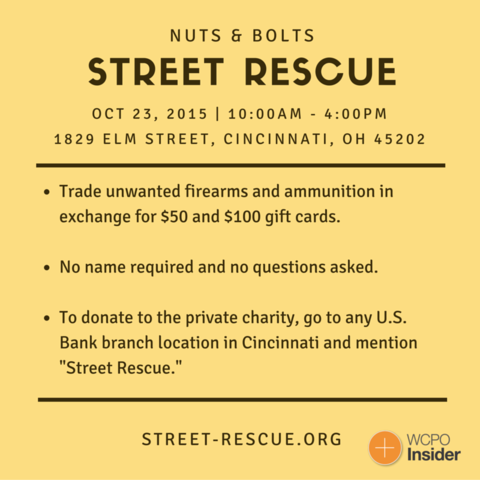 Street Rescue is the name of their new nonprofit firearms buyback program, where people can trade in unwanted guns for $50 and $100 gift cards. It’s a no-questions-asked exchange scheduled for the middle to the end of each month — a time when people are strapped for cash, and trading in a gun can mean feeding a family. “If you had to choose between having a weapon under your pillow that you really don’t know how to operate (or having) breakfast, lunch and dinner, I just wonder what choice a person would make,” said Mallory, who’s also the CEO of the anti-gun violence group, Put Down the Guns and Pick Up the Gloves . The buyback program, which kicks off at 10 a.m. Friday and goes until 4 p.m., comes in the wake of a brutal summer of Cincinnati gun violence. Cincinnati police said Monday 386 people have been shot in the city this year, with 58 homicides. Police confiscated nearly 1,500 firearms during an 18-month period, a WCPO analysis found in June . But the duo knows there are problem guns left to find. “Too many of these guns are in the wrong hands, and we want to change that,” Tassell said. Street Rescue will willingly trade with legal gun owners who simply don’t want their weapons anymore or don’t know how to use them, but they’re really after the people who know where illegal “community guns” are hidden. “The bad guys aren’t the ones who are going to turn them in…. I think what we’re looking for, really, is a lot of ladies who will be coming in, who know where there’s an extra weapon laying around, who know it’s a weapon that somebody’s used wrongly maybe,” Tassell said. If you’ve ever thought criminals always carry the guns they use in crimes, take a walk in Over-the-Rhine with Lt. Joe Richardson, and you’ll think again. Community guns are a real problem for police because officers can't link people with the guns used in crimes. Police come across them every week, but the criminals who use them often avoid charges for carrying a concealed weapon or having weapons under disability. “Everybody can say, ‘Hey, that’s not my gun. I didn’t know it was there. Oh, look at that — a gun! Oh!’ They probably all knew the gun was there,” Richardson said. Here’s a look at where officers have found them. It was discovering the community gun phenomenon that brought Tassell and Mallory together this summer to join forces — and they’re an unlikely pair. Tassel, founder of Street Rescue, is a Republican council member in Deer Park. Mallory is a Democrat and a former state representative from the West End. But the violence pushed their different political views aside when the duo heard the news that a 6-year-old girl had been caught in Avondale crossfire in July . “When you’re tucking your 6-year-old in at night knowing there is another 6-year-old struggling for life, it touches you. Too many times we let things go past us and in our communities that are hurting, we can’t do that anymore,” Tassell said. Tassell and Mallory are still fundraising for the year-long initiative, which is expected to cost between $7,000 to $10,000 to run. Mallory said they hope to raise the value of their gift cards during the holiday seasons to attract people who want to buy Christmas presents and Thanksgiving dinner. Gun buy-backs have been attempted for years, but they’re often "flash in the pan" types of programs that end as quickly as they pop up. Mallory and Tassell said they’re sticking their necks out to make sure that won’t happen. "Nobody wants to walk into an ambush and say, ‘I’m here to trade in a weapon,’ and he’s hauled away in a police car,” Mallory said. Tassell has met with Cincinnati police leaders, including Interim Chief Eliot Isaac, and is confident police won’t be present. He’s hired private security to keep the buy-back event safe, and they’re relying on local pastors like Nick Burnett to build the community’s trust. Street Rescue will collect serial numbers from the guns, but no name or contact information is required to make a trade. They’ll give the serial numbers to law enforcement officials to help them solve crimes, and they’ll give the guns that aren’t reported stolen to federally licensed dealers to sell them. The money from the sales will go back into the program, Tassell said. The program will move to a new location each month, Tassel said. People who trade in their weapons also will have the chance to get involved with other initiatives to reduce violence. "We want to bond with those people," Mallory said. "If they choose drop off the guns and run, fine. But if they would like to pursue what 'Put Down the Guns and Pick Up the Gloves' has to offer, we'll be here for them."